A fishing trip is one of the most entertaining and rewarding outdoor activities. For avid anglers, the weather plays a crucial role in having the best catch. You do not need a particular electronic device to determine if the climate is conducive for fishing. When planning your fishing trips, be sure to observe the weather patterns so you will know the fishing tactics to use. Take note of the water temperatures. Do you know fish moves sluggishly in rivers, ponds, and shallow lakes when it is too hot during the summer season? The same is true during the winter season when water temperatures tend to be lower. While fish are cold-blooded, they cannot maintain their body temperatures like warm-blooded animals and humans. This means that the water temperatures have a significant effect on the bodily functions and temperature of the fish because they become less active due to lack of oxygen in the water. If you are planning for a fishing trip, be sure it is neither too hot nor too cold. You will need to know the baits and lures to use in colder or warm water. Many fishing enthusiasts prefer to go on a fishing trip in the morning. Is this the best time to catch fish? Fish enjoys comfortable water temperatures, which usually occur in the morning. When shallows are warm, the fish is more available and active. This is particularly true on early spring days. In the summer months, fish prefers deeper and cooler waters. 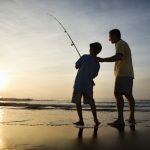 While it was mentioned earlier that high-heat weather conditions could reduce your chance of catching fish, fishing in the early morning or late afternoon might do the trick because these are the times when temperatures are cooler. If you prefer to catch fish in midday, you will need to use deep fishing rigs, baits, and lures. Why? It is because fish moves deeper when there is a decrease in surface oxygen. Hard Rain – If you fish in hard rain conditions, there is a slim chance that you are going to get a great catch. This condition is a poor time to fish because heavy rains increase current flow making it difficult for fish to get a comfortable position, especially in the river. Due to high water levels, you will also be facing waves, rapids, and even unsafe fishing conditions. Light Rain – A light rain breaks up the view, which makes it harder for the fish to see you. Since the rain washes insects, they can serve as a smorgasbord for the fish. If fish appears on the water surface, it will be much easier for you to catch them. Storms – The fish is sensitive to the changes in weather conditions. Before a cold front, there is an increase in feeding, which slows after a storm. Avoid fishing after a cold front. Wait for warm fronts before going on a fishing trip. It may take one to two days for the warm front to occur. Cloudy days -By merely taking a glance at the sky, you will be able to know if the weather condition will be in your favor. If it is cloudy, it is time to pack your fishing gear because cloudy days can improve your fishing experience. Overcast days cause fish to be scattered throughout the area, making it easier for you to pick a lucky spot and catch them. Knowing how these weather conditions can affect fishing will enable you to plan in advance. You can also check out your daily fishing forecast for more information about the weather. Regardless of the weather condition, being equipped with all the essential fishing accessories will help you make all the necessary preparations.